Hello Awesome Friends! Are ya’ll up for a makeover today? I’m actually sharing a makeover of a makeover ha ha! I had decided that I would share this for TFT then paint it white and send it to the shop, but I liked it in the black and thought someone else might also. I put it in the shop as is, but alas, I was wrong. So wrong. Honestly if you’ve seen my booth space, you know it stuck out like a sore thumb, and I should have known better. After several months I brought it home where it sat in my garage for several more months. I have done such a good job at getting through most of the furniture in my to-do pile (notice I haven’t mentioned it at all lately? ), so I decided to tackle this. That tray only lasted a couple of days in my booth, so I thought maybe that same magic would happen for this table too. Poor thing, it really deserves a break! 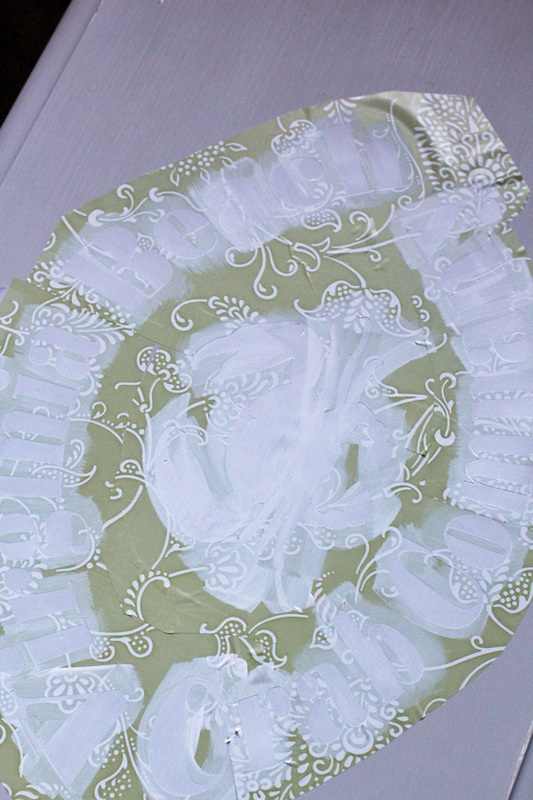 The top is painted in a 50/50 mix of Annie Sloan’s French Linen and Behr’s Ultra Pure White (DIY Chalk Paint). 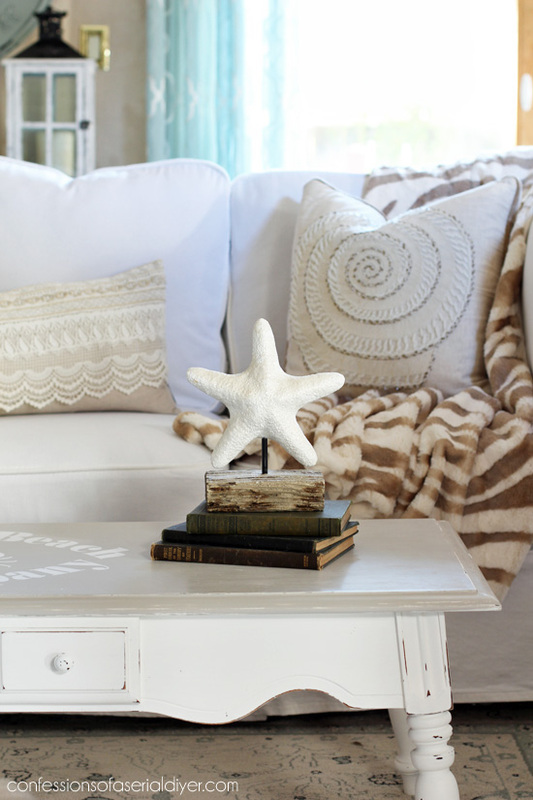 I really love this soft neutral tone. It pairs so nicely with the white base. I love it in front of my DIY slip covered sectional. Unfortunately it would have to be square to work with my sectional. I have the piece that butts up against that right side pushed out of the way for photos. Sometimes I miss having separate pieces. I love how it makes adding words so easy! If you don’t have a machine, you can use the methods shown HERE to add graphics as well. 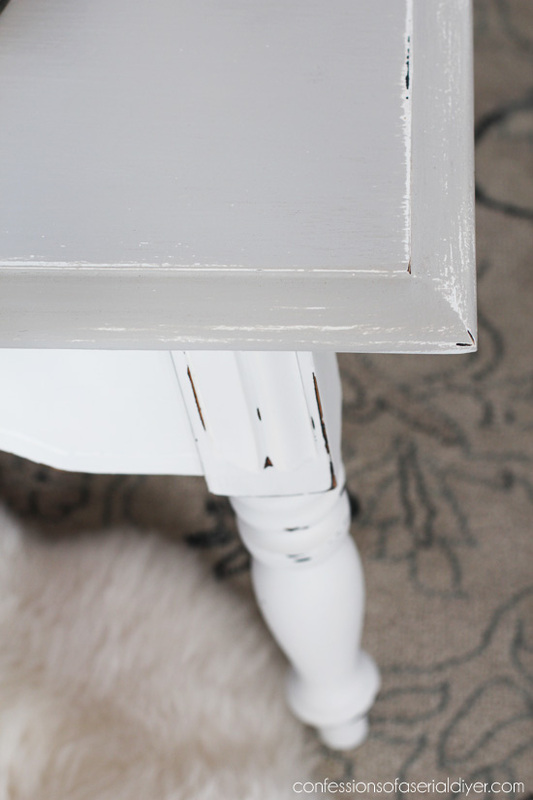 I used my DIY chalk paint and a smallish brush to paint three coats, then removed the contact paper when the paint was barely dry so it didn’t smudge anywhere. I touched up any boo boo areas (there are almost always boo boo areas! ), and sanded lightly after the boo boo fixes were dry. 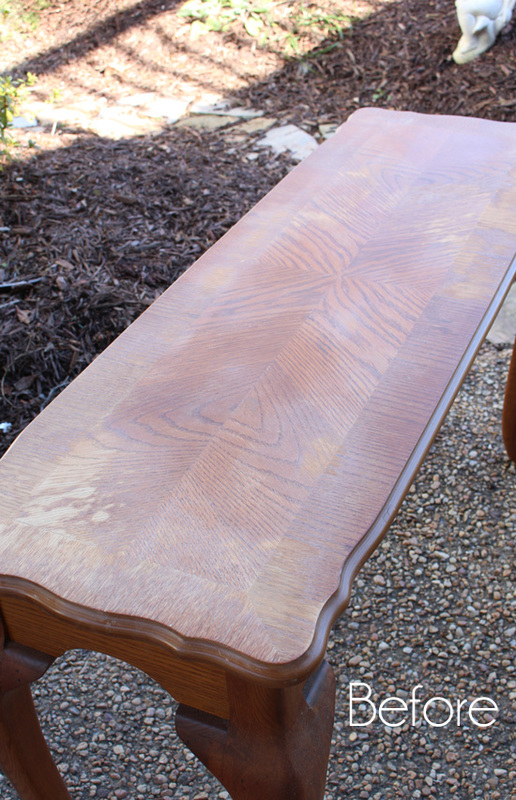 A coat of Annie Sloan’s clear wax to seal finishes this table off. 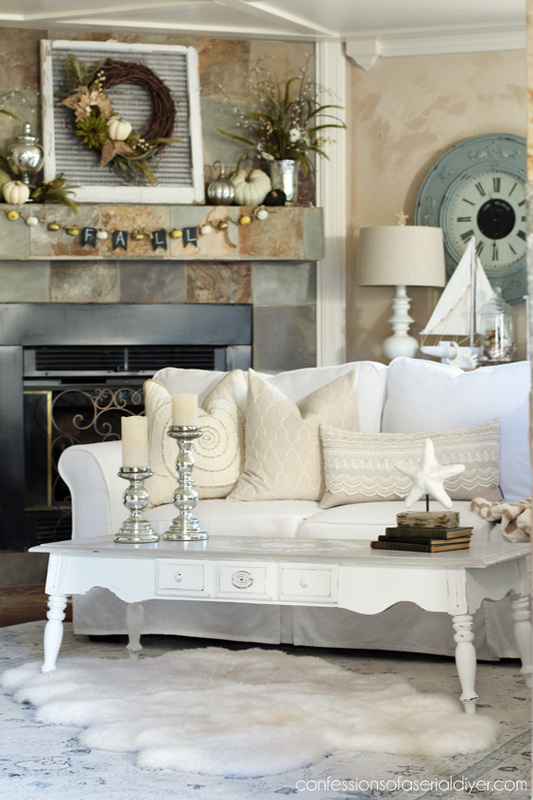 You can see I still have my Fall mantel up…I am so looking forward to pulling out my Christmas decorations! We are hosting Thanksgiving this year so I don’t feel like I can bust out the jingle bells just yet. I changed out the hardware for some I had left over from other pieces. They got a couple of coats of Rustoleum spray paint in Satin White. I find the easiest way to shabby them up is to drop them on my concrete garage floor and drag them across the floor a bit. Much better! Here’s hoping it sells this time! 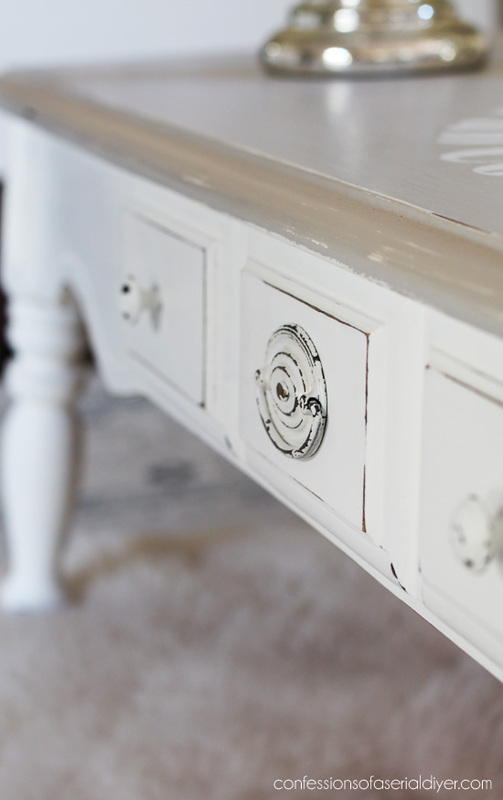 You can see my full tutorial for how to paint furniture using chalk paint HERE. UPDATE: Bam! 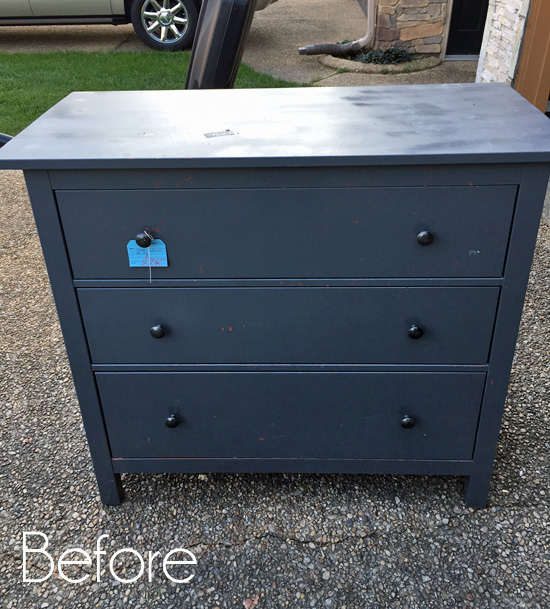 See how Jack and I transformed this dresser HERE now! I LOVE IT! I wouldn’t have bought it from your shop black, but sure would now! I can’t wait to see the dresser you and Jack worked on together, I can bet it will be great!! Christy, I always love you work, but I admit to being sad that the table didn’t sell in its black incarnation. I loved it and wish I lived close enough to welcome it to my own home. Don’t get me wrong. 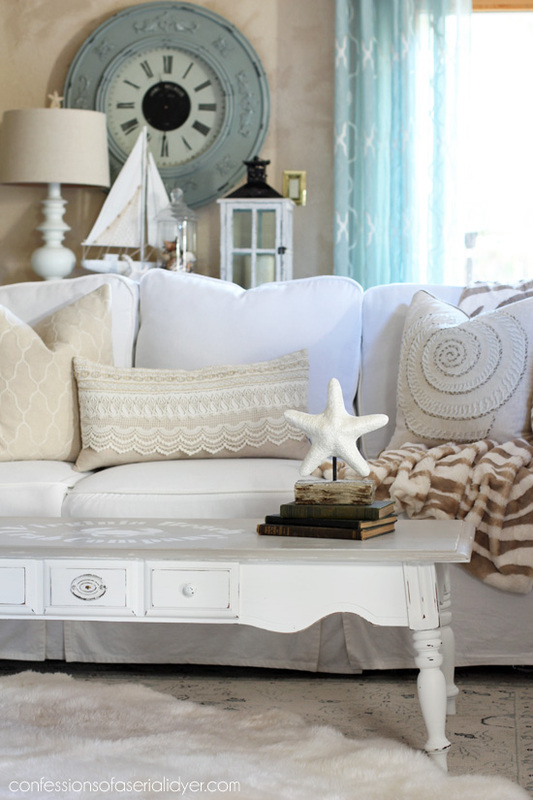 The coastal vibe is nice and I can see how it would fit into your shop, biu I really, REALLY loved the black table. Oh well. Thanks for continuing to inspire me! My goodness, Christy, I loved it in black but I love it in white too! 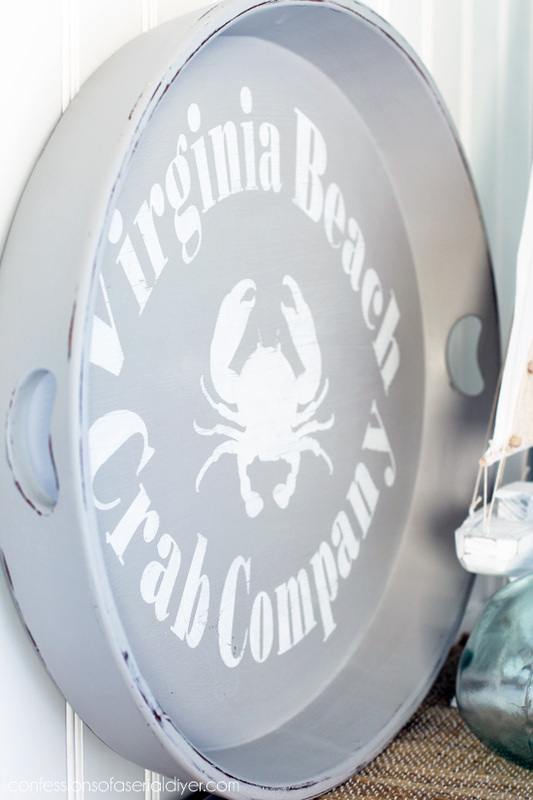 I have a question for you about the “Virginia Beach Crab Company” design – is the design about as big as a sheet of vinyl? I have a Cameo but I don’t like using designs that need to be pieced together – I have a hard time getting them straight. Any tips would be appreciated! Thank you, as always! I bet it sells now! I like it better than the black! Black looks nice but it shows every speck of dust there is (ask me how I know, lol). This is so much better! I like it both ways, but you have mentioned before that white (or some form of white) seems to sale faster. Good luck. 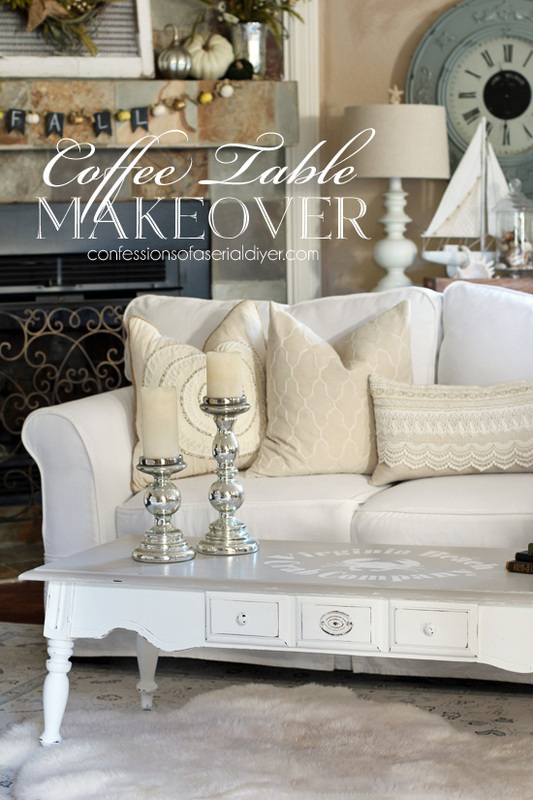 Hi Christy, I love both versions of this coffee table make over 🙂 I hope it sells for you this time, for some reason people really love white! 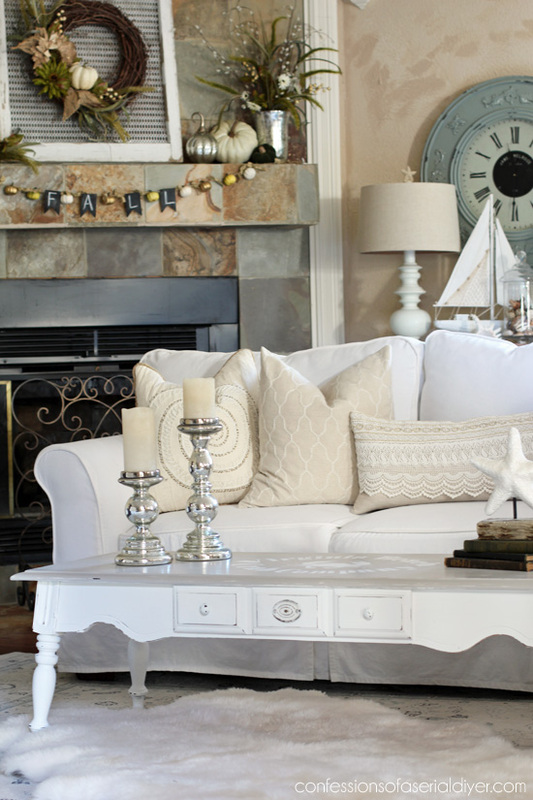 I think most believe that it ‘goes with everything’ which may work with clothing but not necessarily decor. 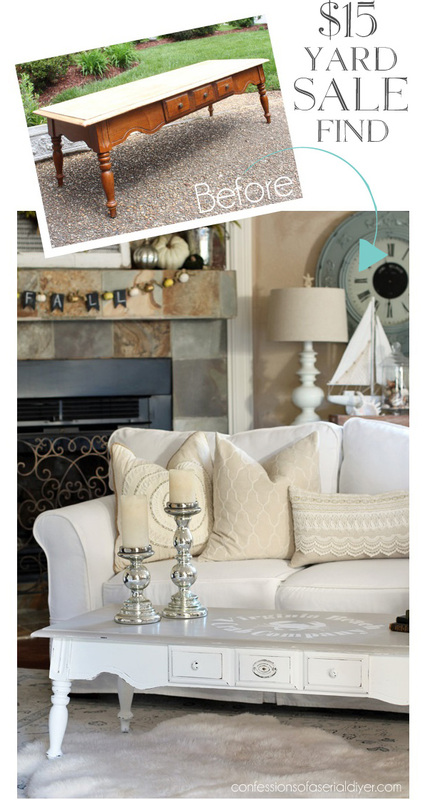 That table was a pretty unlovable “before”! I adore the black, but see how it wouldn’t appeal to your buyers. I don’t think it will last long in its new incarnation. Dragging hardware across the cement floor? Have to put that tip in my list for future redos! 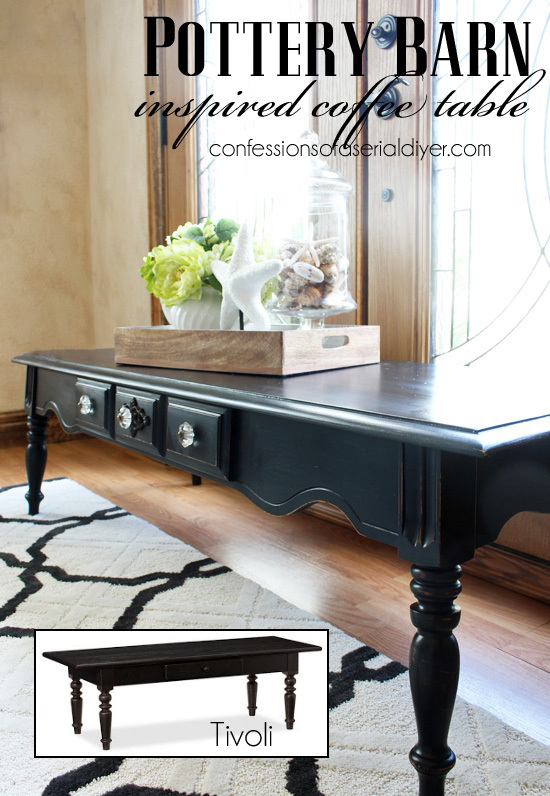 Love that table makeover, but I also personally loved the black. I guess it will be the best for the market in your area, which is what really matters. 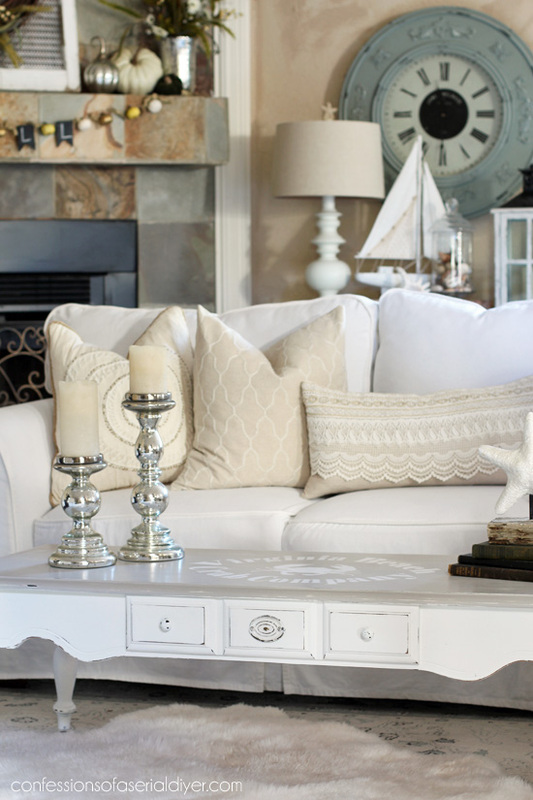 Your furniture always looks fabulous! How about sharing the mashed potato crockpot recipe? I made one a few years ago with cream cheese in it that was quite good, too. Thanks. 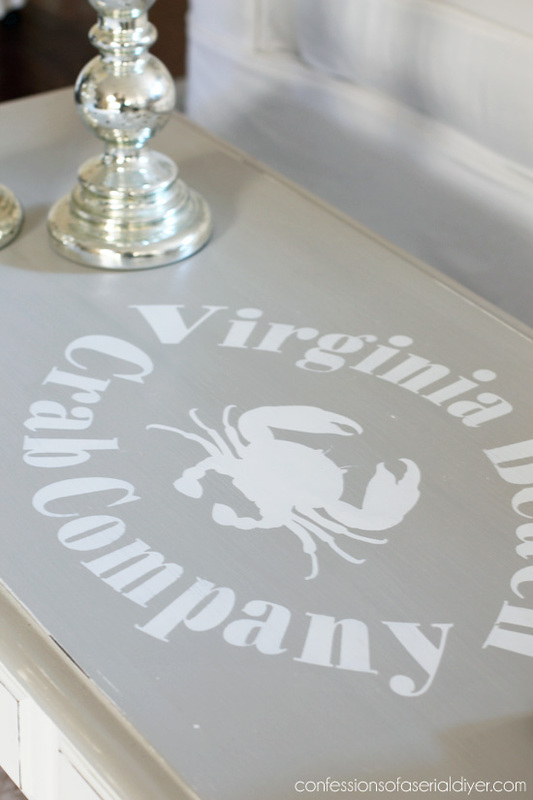 I liked the table in black but I LOVE it in white, especially with that cute crab graphic. You’ll have to keep us posted because I suspect it’s going to sell quickly now. I love it both ways. Lovely job. I think your original ‘knock-off’ was a very good version, however, I *do* like this makeover a bit more. 😉 More your style, too, it seems! Your description of distressing your hardware made me giggle! 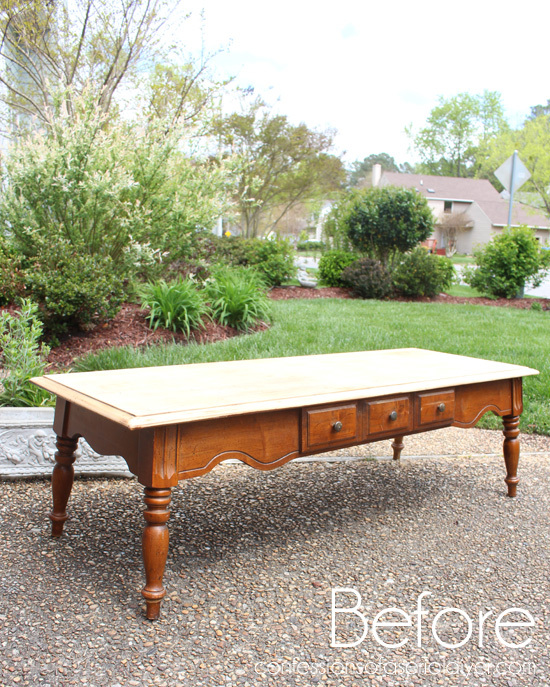 2 great table make overs! Now just have to see who it appeals to most. Taste is very subjective. 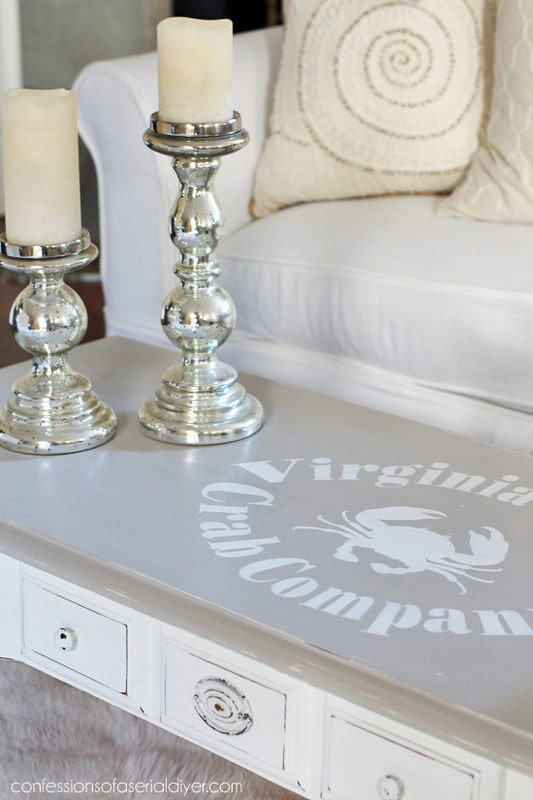 But that’s a awesome stenciled coffee table, I would buy it! Thx for always inspiring. Very nice, although I definitely see why you tried it in black. I really like that too. Those legs are wonderful! No way is that the secret to aging your hardware! My son and I have had quite a time of it, and the solution is so easy! Haha!